In addition to our traditional treks we offer a variety of tailor-made horseback rides. If you've perused our web site without finding a trip that matches your wishes, let us know and we'll be happy to plan a unique horseback ride for you! Our network of trails and campsites is intricate and broad which allows to combine different routes and accommodation options to suit your preferences. In the past among others we proudly organized for 23 avid riders a benefit ride to collect funds for children with cancer. 5 days, 4 overnights in tent-camps, two at the natural hot springs of "los Pozones" and "Termas de Pangui" Tent camp ride with accompanying 4x4 trucks and camp team who put up the tents and organized the meals. 6 guides on horseback, 1 nurse (which we needed at no moment), 2 drivers, 5 helper for cooking/camp. "I just wanted to write a brief note to thank you for the hard work you put in on the recent horse trek. The feedback from the group members has been tremendous, and people have been very impressed with the standards and quality of service which you provided. I hope that the large group was not too much of an issue in the end, and that you would consider doing a similar trek for us in the future." 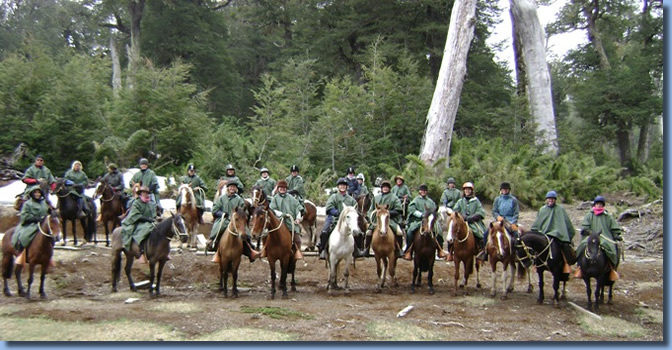 A 6 day riding adventure (4days on horseback) we organized for the Columbian Jorge Collazos and 15 of his friends. 2 nights in the mountain lodge "Nevados del Sollipulli"